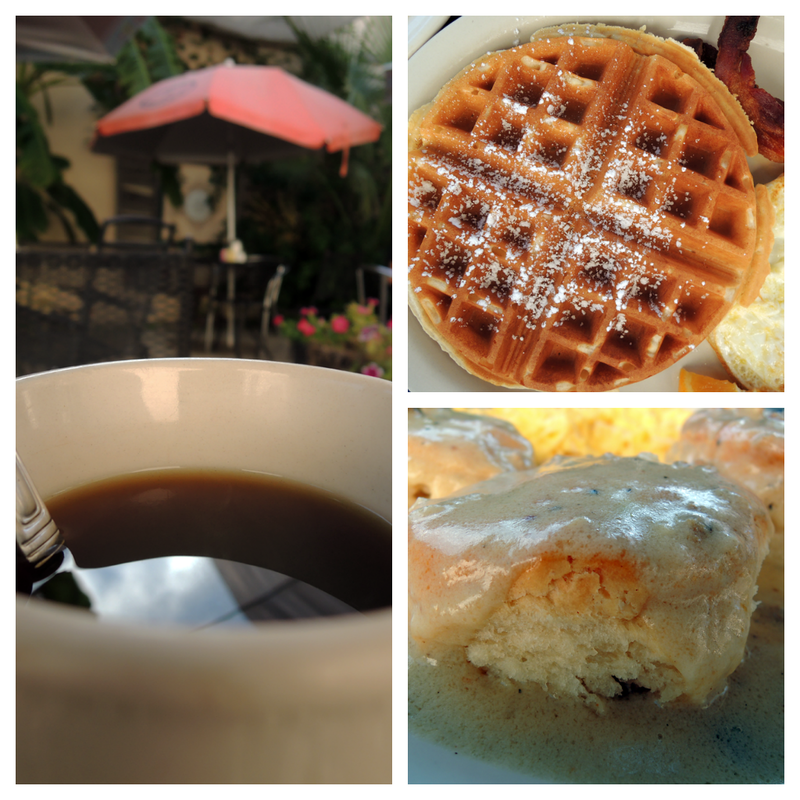 Through a series of fortunate events, my wife Tracy and I recently got a morning free together in San Antonio. Though the Koffee Kup may not be a typical spot for a romantic interlude, it was just about perfect for our little getaway. The Koffee Kup is far off the beaten path, in West San Antonio, about a 15 minute drive from downtown. It's a quirky little greek-columned storefront sandwiched between nondescript stores, in a mildly dingy stretch of 1970s stripmalls. 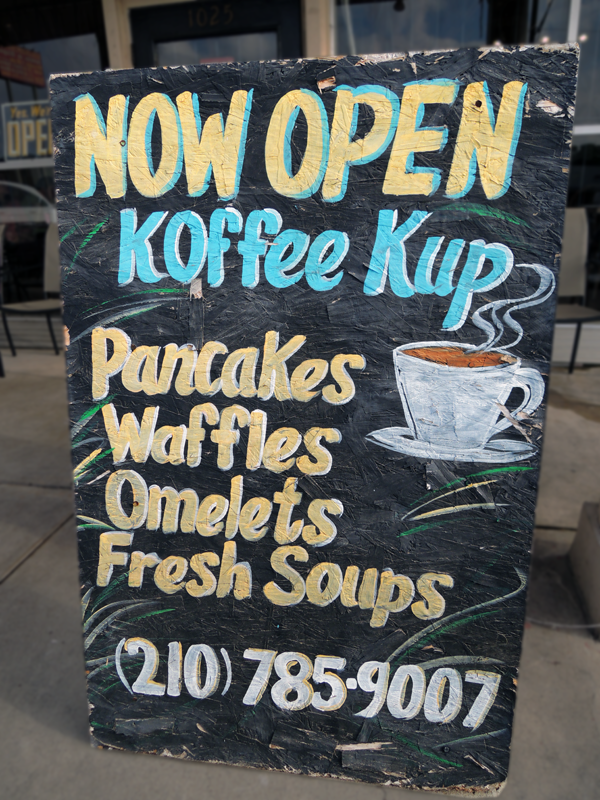 That said, after years of upscale and self-conciously ironic comfort food in Austin, it was a little bit of a relief to step foot in an actual functioning greasy spoon. The place is tiny - a small patio out back and maybe 10 tables in front, with a shockingly tiny open kitchen, and the register off to the side. The linoleum floors, the wood-pattern veneer tables, the simple wooden chairs, all standard issue diner basics, a little worn around the edges, but clean and cheery. The Kup pulls away from the everyday almost immediately. Warm, friendly, smiling waitresses bustle everywhere - like you've been a once-a-day regular for years even though it's the first time you step through the door. We ended up taking a table out on the patio under brightly colored umbrellas in the slight breeze of the morning. Over sips of drinkable coffee, we settled on splitting a Cowboy Breakfast - eggs, biscuits, gravy, sausage - and waffles. It was an enormous amount of food. The sausage gravy was intensely fresh, peppery and lighter in texture and taste than the slop that passes for cream gravy most places. The biscuits, fresh out of the oven. The sausage had a nice bright flavor and easy crumble. The details across the board were impressive, from the frequent coffee refills to the perfect crisp of the waffle. 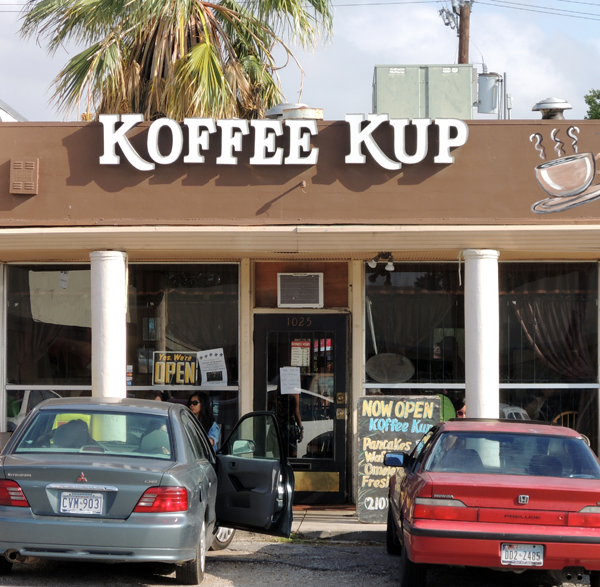 Everything that the Koffee Kup made, they made very well. Low spots were the bits they didn't make themselves - the bacon wasn't particularly impressive and the syrup, as one would have expected, was the corn syrup goo that passes for maple most everywhere. Side note: seriously considering traveling with a flask of maple syrup to avoid this in the future. It was a place that was extraordinary in it's ordinariness. 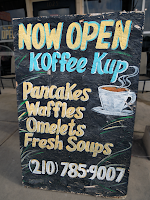 There was no attempt to make anything not made a thousand other diners across the country, but every chance they had to make it well, the Koffee Kup delivered. Crowded, but without a wait, the Koffee Kup was full of happiness and pride - a place you can imagine had stood in that spot for generations (even though it just opened in 2009). Gems like this exist hidden in cities all over the country, I'm glad we managed to find this one.